Om Alec Khaoli - Say You Love Me. Vinyl LP, CD. Bleep. 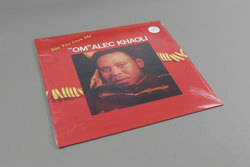 Awesome Tapes From Africa add to their South African boogie pop reissue catalogue with this amazing and previously ultra rare Om Alec Khaoli gem. Having his own studio at a time when black artists were shunned by the music industry really paid off, as ‘Say You Love Me’ is a refined and mass-appealing pop gem that has stood the test of time. However, it’s the unbelievably good ‘Enjoy It’ that’s the top cut for DJ’s here, sounding really similar to Om’s band Harari’s B side hit ‘I’m Waiting’. Big thanks to ATFA for getting this one back in circulation – what a track!